Back in 2009 while I was working on my first novel, I had some great zombie influences. I always try to take in multiple media for entertainment. George A Romero’s “Of The Dead” movie series have always been a guilty pleasure. The “Resident Evil” video game series and “Zombie Zin” wine still make it into my house to this day. And Joe McKinney’s “Dead City” was the first zombie novel I read that really made me like the genre. Runners up were “Marvel Zombies” and Michael Jackson’s “Thriller”. What are some of your favorite Zombie stories or influenced things? Make sure to tag #scrypthalloween. Roberta of “Homemade Delish” (also my wife) joins me on the latest episode of Think, Sip, Write as we discuss wine after visiting our favorite vineyard. Here’s a little different post that I wanted to share for all of the wine lovers out there. When I write and am in the mood, I’ve got a cup of coffee by my side. When I’m enjoying my final work or relaxing, I prefer a glass of wine instead. I’m quite picky with my wines, and I tend to shop with a certain mind set. Then I started to see wines that had similar themes to my books. I decided to pick up the bottles and try them out. So far, I haven’t found a bad one. 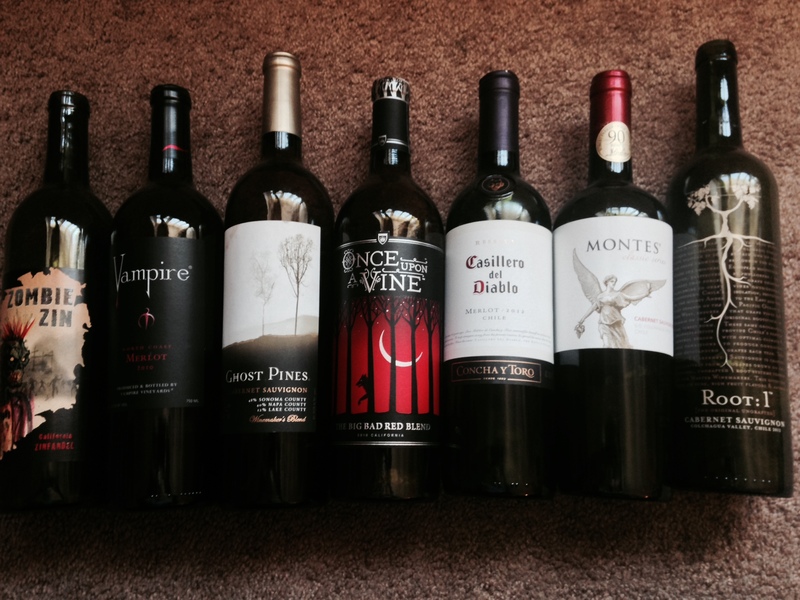 From the left is Zombie Zin, Vampire Merlot, Ghost Pines Cabernet Sauvignon, Once Upon A Vine Big Bad Red Bled, Casillero del Diablo Merlot, Montes Cabernet Sauv, and Root 1 Cab Sav. Since I’ve represented zombies, vampires, ghosts, werewolves, Demons, angels, and Eden, I’m still looking for a few others. Does anyone know of any themed wines that might match with Technology, Pandora’s Box or anything else that would fit? Feel free to comment and by all means, if you try the wines listed, post a review. Raising a glass to you all on my birthday. Cheers! For Day #2 in my 31 Days of Halloween series, I figured I’d focus on my second novel. This time I’ll share some historical events that I tied into BLOOD, THE SECOND HELPING. How do vampires fit into human history? What events were they directly involved with? Is our history as true as we are taught? Here’s a list of hints toward what happens. 1) King Arthur was the first human to figure out the weakness of a vampire he encountered, so the legendary sword, Excalibur was forged from silver to be placed in the “stone,” which is not quite what legend says. 2) The Sphinx in Egypt has been a mystery for ages, but there is much more to the mystery and riddle than we know. Two vampires that ruled the land long ago had the monument built to hide something that could prove fatal to their kind. 3) Vlad “The Impaler” Tepes may not be the Dracula that Bram Stoker wrote about, but he is certainly tied closely to the man who truly is the dark vampire lord. 4) Chicago in the early 1900s was filled with heavy mob activity. Imagine that scene when a vigilante vampire begins abducting them. Tempers will rise and betrayal will ensue. 5) Wine has changed throughout history, but no one knows that wine is good for the blood more than a vampire. The longest lived vineyard in the world rises and falls. 6) The Fountain of Youth holds the key to the mysteries of why the Amazon rainforest is so vast and full of life, but the Fountain itself is a mystery. Could Abel (the world’s first victim of murder) be the answer? 7) Elizabeth Bathory’s name may make some people think of the game where you stare into the mirror and call “Bloody Mary”, but what are the true origins of that urban legend and why? 8) There’ve been numerous stories in the past thirty years about teens who actually believed they were vampires. In reality they aren’t but following the trail of one of these teens might make you see it in a different manner. 9) Various faiths tell the story of when Cain killed Abel, but what was the mark that was truly placed on Cain by God? 10) What was going on behind the lines during the most violent battle of the Russo Japanese War? 11) The CIA has been involved in many conspiracies, but there is one that has been kept a secret for over 40 years… They know about the existence of vampires and may even have employed the like in their ranks. 12) The story of Samson and Delilah is filled with betrayal, lust, and (you guessed it) a vampire. 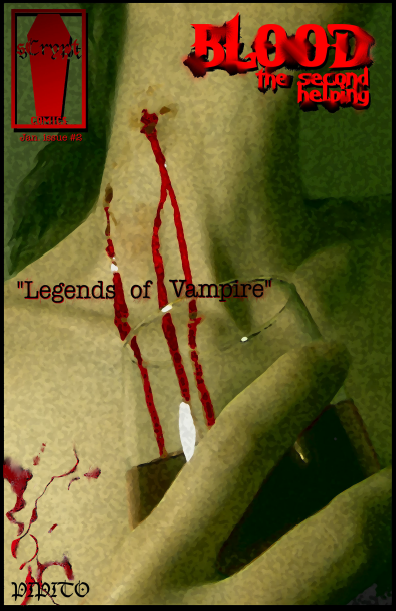 BLOOD, THE SECOND HELPING and its spinoff graphic novel comic, LEGENDS OF VAMPIRE, are available through links on the right side of this page. Stay tuned for more 31 days of halloween, tomorrow. My fourth novel, “Souls 4 Supper,” and its comic book spinoff, “Ghostly Hauntings” center around the topic of death and the afterlife. The stakes are upped for all of the protagonists as the deal with ghostly entities. What kind of ghosts are we talking? All kinds. As with my other novels, i attempted to incorporate all variations of lore and bring about something new, where it can all coexist. 1) Seeing the dead: Some people with near death experiences survive only to be able to communicate with the lost souls of the dead. They are forever tormented unless they find a way to release each lost soul into the afterlife. 2) Ghost Towns: More than just myths and urban legends, if an entire city’s residents were to die from some tragic event, and their souls are unable to find their way to the afterlife, then their ghostly remnants are left behind to wander. Unfortunately over millennium, they begin to lose their minds, so while some ghosts have purpose, most wander aimlessly, unaware of their former existence or the need to find final rest. 3) Djinns (Genies): These are people who have done something so wrong, that their spirits are forced inside a magical object. The longer their spirits remain, the more powerful they become. However, their powers come at a cost, as it is unpredictable to how their final usage will appear. 4) Children: Up until the age of 5, most human children are able to see ghostly apparitions. They often giggle, and interact with what us adults perceive as them having imaginary friends. In reality, the children aren’t imagining anything. 5) Hoaxes: Many ghostly reports are false. Some people thrive on scaring others by creating spectres, photographs, and tall tales to create the urban haunting legends. 6) Ghosts trying to communicate: Some spirits are trapped here with a purpose. They will not rest until their murderer is discovered. Often these ghosts move objects in our world to try to leave clues for us to find. These spirits often become angered, and frustrated at our lack of perception. 7) Catching Ghosts: Ghosts can be captured by linking the four planes of existence. There is Heaven, Hell, Earth, and the spirit realm. By disrupting these planes with extreme emotion, it is possible to summon a spirit here or make it visible. Then it can be contained through certain uses of EMF (Electromagnetic Frequencies). 8) Dreaming: When we dream, our souls have the ability to leave our bodies. In this state, our spirits travel to different places, times, possible futures, and alternate realities. The reason that we cannot often recall these dreams is because the human brain can’t fully process this type of travel. Our souls are fully aware of what happens even though we may not. 9) Reincarnation: If you were to die, would you come back as someone else? Depending on whether you repent for your misdeeds or are honored for your heroism, tells how those can return. Not everyone is reincarnated. Only a few are given this chance. 10) Famous Encounters: Traveling spirits take a look closely at events throughout history. Veronica Beranice wiping Jesus’ face, Joan of Arc, JFK’s assassination, The Tower of Babel, The Rosetta Stone, Hua Mulan, Bonnie and Clyde, and Atlantis are some of these seen closer in Souls 4 Supper. 11) Pandora’s Box: This fabled box is in fact shaped like a pyramid. Its contents, if opened will spew forth chaotic realms. It acts as a gateway for souls to enter to the afterlife, or something more powerful to exit into our world. Chaos comes in many spiritual forms. It all depends on who opens it. 12) Book of Knowledge: This haunted book will be different for every reader. Its spiritual essence, born of the tree of Knowledge from the Garden of Eden, will gaze into one’s soul and biography their life. 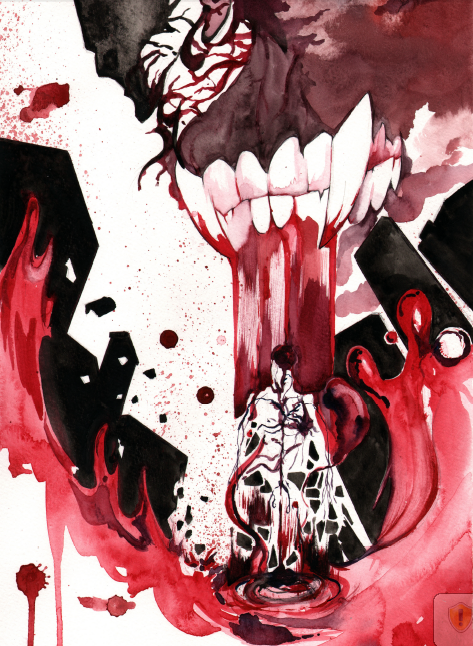 13) Possession: Some spirits are friendly, while others are quite the opposite. When two souls inhabit the same body, an internal struggle begins. Only the most powerful and willing soul will become the dominant entity. 14) Ectoplasm: Ghosts powerful enough to exist in this world will leave behind a gooey residue. This residue will evaporate however in direct sunlight or bright light, which makes analyzing it a difficult task. 15) Wraiths: Wraiths are vampires that die and are unable to pass on to the afterlife. These immortal beings are strengthened and able to return to the real world if they consume enough powerful souls to empower them. Rick’s favorite video game involving ghosts is Silent Hill. His favorite ghost movie is the Sixth Sense. His favorite ghostly character is DC comics’ Deadman. One of his favorite ghostly books is Philadelphia Ghost Stories by Charles J Adams III. Dan’s favorite video game involving ghosts is Soul Reaver. His favorite movie about ghosts is Ghostbusters. Lloyd the bartender from The Shining is Dan’s best ghost of the year. Shakespeare’s Macbeth is Dan’s favorite ghostly book. What are your favorites? Are you a ghost story fan? Grab yourself a copy of “Souls 4 Supper” the novel. It is available at www.lulu.com in softback book and on www.amazon.com for the Kindle. 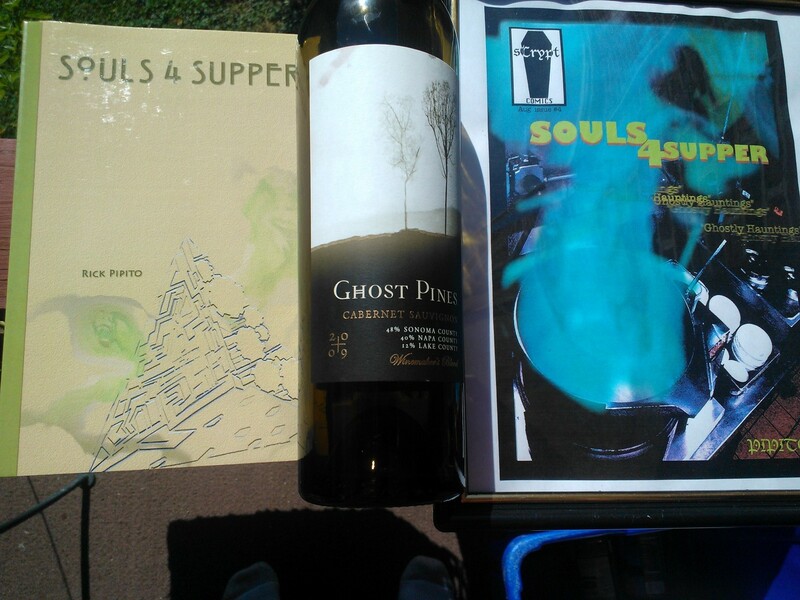 Also, the spinoff comic book “Souls 4 Supper: Ghostly Hauntings” is available for purchase at www.indyplanet.com. Help support our soul sucking.